Better widespread education and advancements in medical technology have been contributing factors to Americans living longer on average. A report from the Centers for Disease Control and Prevention shows that the number of Americans older than 100 has increased more than 43 percent from just one decade ago. However, the key isn’t just to live longer, but to live healthier as well. Keep a sunny disposition. One key to successful aging is your attitude. Being optimistic, living life to the fullest, developing your full potential, and meeting older age head-on may make a difference in how your body ages. A positive attitude may also help reduce the chances of being disabled in the future. Take care of yourself. In a perfect world, the main purpose of health care would be to prevent illness. Unfortunately, today most health care is to fix problems that have already developed. To improve or maintain your health, stay current with tests and screenings for cholesterol, blood pressure, diabetes, bone health, and cancer, and follow your doctor’s orders for any condition you already have. Keep moving. Exercise is critical to good health. It can help you control your weight, strengthen your bones and muscles, improve your mood, and reduce your risk of many serious illnesses. Endurance, strength, flexibility, and balance exercises can all help to improve or maintain your health. Use your brain. Lifelong learning means continuous learning throughout life. It includes learning by thinking and doing, acquiring new knowledge and skills, and cultivating a mind that is adaptable to different ideas, people, and cultures. Similar in the way that muscles need regular exercise to keep them flexible and strong, we need to exercise our brains as well, especially as we age. Learn a new language or activity, play an instrument, or travel to help keep your brain fit. Eat your veggies. Eating a variety of whole foods, including lots of vegetables and fruit, can help your overall health. Try to eat across all the food groups with an emphasis on foods the way they are in nature, without additives or processing. Focus on nutrition rather than calories, eat smaller meals, and slow down while eating and enjoy your food. Get some shut-eye. Sleep, like nutrition and physical activity, is critical to your health and well-being. Getting at least seven hours of sleep per night is ideal. Adequate sleep can help improve your performance at work and in school, strengthen your immune system, and help prevent diabetes. To get the rest you need, stick to a sleep schedule, keep the room dark and comfortably cool, and avoid glowing screens like TVs, computers, and smart phones before bed. Be a butterfly. Social relationships are a fundamental part of health and wellness. We need to interact with friends and family, neighbors, co-workers, and strangers. Social isolation and loneliness can be bad for your health. To keep an active social life as you age, volunteer, adopt a pet, join a class or online community, and look for clubs that interest you. Thankfully, compared to past decades, the elderly are living longer and in better health than ever before; however, up to one in four elderly Americans are not living this ideal life. If you are living longer than planned and have health issues, costs can accumulate quickly. Health care is one of the biggest expenses in retirement. A 65-year-old couple retiring in 2016 will need an estimated $260,000 to cover health care costs in retirement. This number does not include long-term care and seven out of ten individuals over the age 65 will need long-term care at some point during retirement. So, what can you do? First things first, if you are earning an income you should be saving for retirement. The younger you are, the riskier you can be in your investments because you have many years to make up for any losses before you retire and need those funds. As you near retirement, you’ll likely want to make adjustments to help protect you from market risk. Ideally, your retirement funds will primarily be going toward hobbies and everyday living, but if health issues arise those funds will be vital. Medicare only covers around one-half of a retiree’s total health care expenses and you may need to reach into your retirement funds to cover the rest if you have no other options. Signing up for Medicare is one of the first major decisions you face as you reach retirement age. You’re eligible for Medicare benefits in the month you turn 65. During the initial enrollment period, you have a seven-month window to sign up. However, many people are surprised to learn that there are costs involved with the program. Even after paying into Medicare throughout your career, you also face monthly premiums and cost-sharing provisions once you’re enrolled in the program. 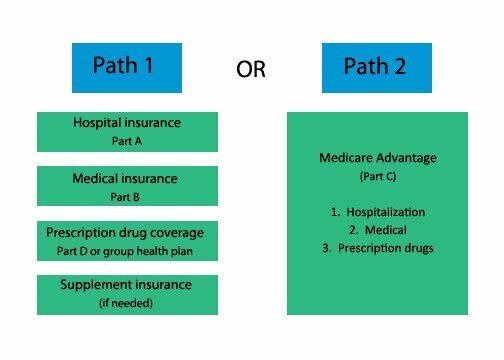 There are two Medicare paths to consider for coverage when you sign-up. Path 1 offers a blend of coverage from government and private health insurers. Path 2 is offered strictly through private insurers approved by the federal Medicare agency. 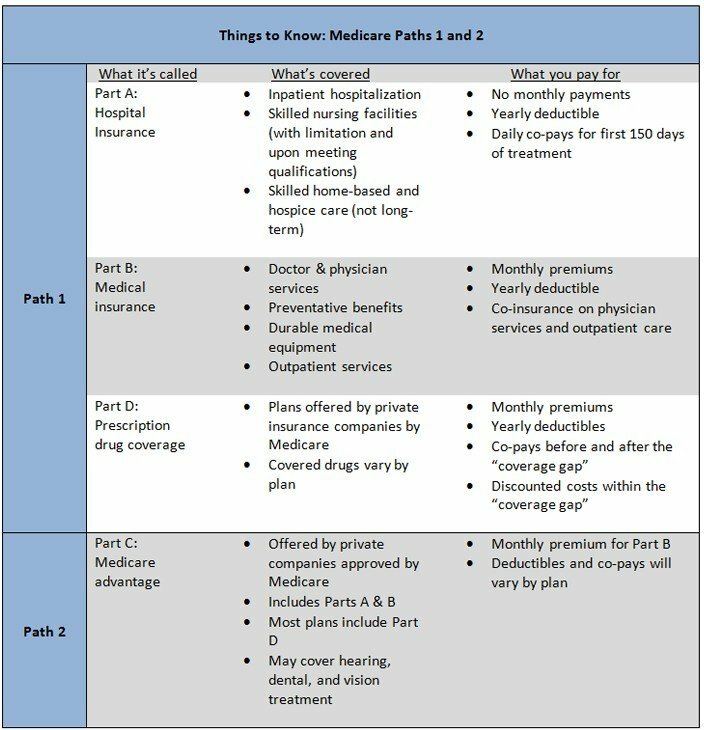 As you can see, Medicare covers a great deal of expenses, but there are also plenty of costs that will come out of your own pocket. This is where your retirement savings will begin to come into play, unless you have some sort of long-term care plan in place. Planning ahead for the likelihood of needing long-term care can make the difference between financial security and devastation. Unfortunately, people don’t like talking about long-term care. Many think long-term care (LTC) means “nursing home” but this isn’t necessarily always the case. According to the American Association for Long-term Care Insurance, in 2014, 51 percent of LTC claimants had home health care, 18 percent were in a community care facility (assisted living/adult day care), and 31 percent were receiving 24-hour professional assistance in a nursing home. There is a strong likelihood that you or your spouse will need LTC at some point after the age 65. The total cost of LTC treatment can easily approach or exceed $200,000. In most cases, Medicare does not cover LTC expenses so the burden of these costs will ultimately rest entirely upon individuals and their families. There are insurers that offer long-term care policies, but these are becoming less and less available. Long-term care insurance is expensive to own and expensive to pay out, so many insurers have pulled out of the LTC insurance business. Instead, insurers are offering LTC riders than can be added on to a life insurance policy. How life insurance basically works is that you buy a certain amount of coverage and when you die your beneficiaries are paid a check in that amount. With an add-on long-term care rider, you can receive “living benefits” if you end up needing long-term care.